The Journal of Polymer Science Innovation Award is to recognize polymer scientists under the age of 40 to celebrate their significant research innovation and achievement in the field. The Journal of Polymer Science Innovation Award recipient is recognized with a symposium in association with PMSE at the ACS Fall National Meeting, followed by an open reception. The polymer science landscape has evolved dramatically over the past 50 years, advanced by innovative scientists working on the chemistry and physics of polymer systems. The award was initiated in 2012 to recognize new scientists and researchers. The award is granted to an individual without regard for nationality and nominations who is under 40 are welcome from all sectors of industry, government and academia. Please see the Journal of Polymer Science nomination page for more details. The Journal of Polymer Science Innovation Award is now in its seventh year, and we are delighted to honor Rachel O’Reilly for her pioneering achievements at the interface of chemistry and polymer science. The Innovation Award was established in 2012 to celebrate significant research innovation and achievement in a polymer scientist under the age of 40. The recipient is recognized with a symposium in association with the Polymeric Materials: Science and Engineering (PMSE) Division of the ACS at the ACS Fall meeting. Rachel currently holds a Chair in Chemistry at the University of Birmingham, UK. She received her Ph.D. in Chemistry from Imperial College, London with Professor Vernon C. Gibson, followed by a Post-Doctoral research position at IBM Almaden Research Center under the joint direction of Professors Craig J. Hawker and Karen L. Wooley. She was then awarded a Royal Commission for the Exhibition of 1851 Research Fellowship, followed by a Royal Society Dorothy Hodgkin & Mays Wild Research Fellowship at the University of Cambridge. 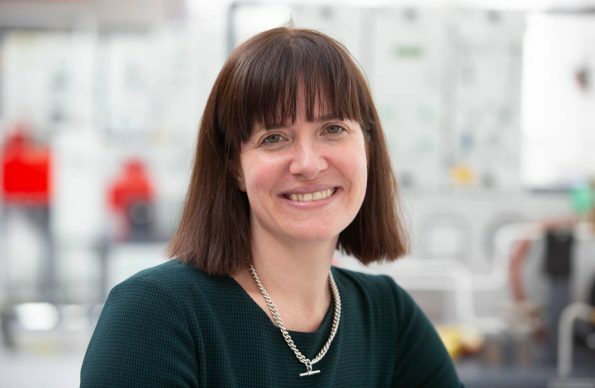 In 2009, she received a career-acceleration fellowship from the UK's Engineering and Physical Sciences Research Council (EPSRC) at the University of Warwick, was promoted to full Professor in 2012, and moved to the University of Birmingham in 2018. Rachel was the first to observe the crystallization-driven self-assembly of poly(lactide)-containing block copolymers to produce cylindrical micelles of precise lengths. Controlling the formation and size of 2D nanostructures is a challenge, but Rachel’s team has made remarkable progress in tuning the morphologies of these structures in the areas of emulsion stabilizers and gel additives. Working at the biological-materials interface, Rachel employed hybrid bio-synthetic nucleobase-containing polymers for the dispersion of single-walled carbon nanotubes to construct hybrid functional materials. Building on her early studies involving chiral amino-acid-based polymer systems, she employed multistep DNA-templated reactions for the robust and selective sequence-controlled formation of oligomer sequences, a groundbreaking achievement in synthetic polymer chemistry. Rachel’s outstanding ability to address and solve grand challenges in polymer synthesis have resulted in 6 patents, 4 book chapters and 167 publications. Spanning inorganic, organic, and polymer chemistries, the creativity and innovative nature of her work are evidence that she will continue to rise as a leading figure in polymer science, and we are delighted to present her with the Journal of Polymer Science Innovation Award.